← Guest Authors: Makayla and Millie–“B” Collection! Posted on March 9, 2015 by Jen Bearden	• This entry was posted in Classroom, First Grade, Read Aloud, Technology, Writing and tagged audience, blog, chapter book, first grade, Notability, purpose, technology, writing. Bookmark the permalink. 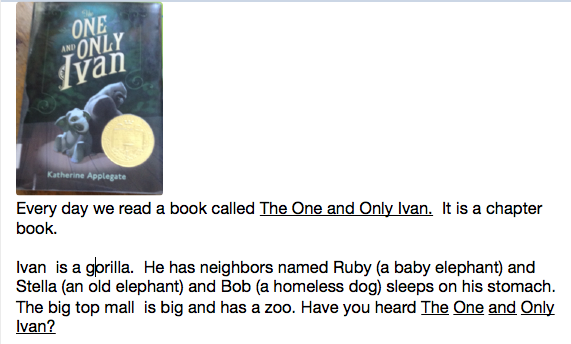 I’ve heard of The One and Only Ivan because I wrote it! Hope you’re having fun. Keep on reading and writing! I am going to have to print this our for Charlie’s baby book. How cool that you take the time to write to your littlest fans! Thanks!!! We are now reading this book at home too, though I think you are ahead of us in your classroom. Good book so far! Hard to not read “one more chapter each night”! This is a book that is on my “to-read,” list for sure. Many kids have told me how great it is. They all have different reasons. Why do you suggest I read it? We are going to reread it as a family when you guys are done. Charlie has been talking about it a lot at home. Hi Charlie and friends! I know The One and Only Ivan, too!!! I really liked the book and meeting all of the animal characters. I think animal characters are some of my favorites. Do you have a favorite character in this books! It is hard for me to decide which I like the best. Oh I love that book! I read it 2 years ago! Isn’t it sad? What is your favorite part so far, or if you’ve finished, what was your favorite part? I was in Elizabeth’s class when she read it….. It’s so good but so sad.